In Desirable North Whittier. Single Level with Elevator Access. Close to so much - Parks, Hiking, Uptown Whittier, Rio Hondo College, Whittier College, and Conveniently Situated to Freeways. 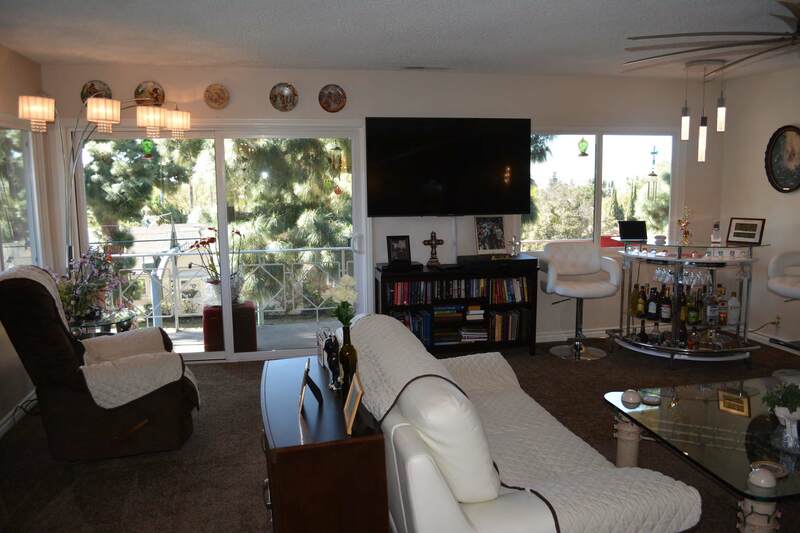 With Spectacular Views of The City and of Catalina Island via Energy Efficient Vinyl Windows, and a South Facing Balcony Through EE Sliding Doors Off Spacious Open Living Room. Remodeled Galley Style Kitchen Features Granite Counters, Refrigerator, Stainless Steel Appliances and Modern Laminate Flooring. This End Unit is Also Appointed with 2 Spacious Bedrooms, of Which One Bedroom features an Ensuite with Walk-In Spa/Tub. New York Style Entry/Foyer. Beautifully Maintained Secured Building with Landscaped Grounds and Private Courtyard. Includes 1 side of shared 2 Car Garage. Community Laundry, Storage, and Association that pays Gas, Water & Trash. Complex is FHA & VA Approved. Perfect For Any Buyer and Priced to Sell!